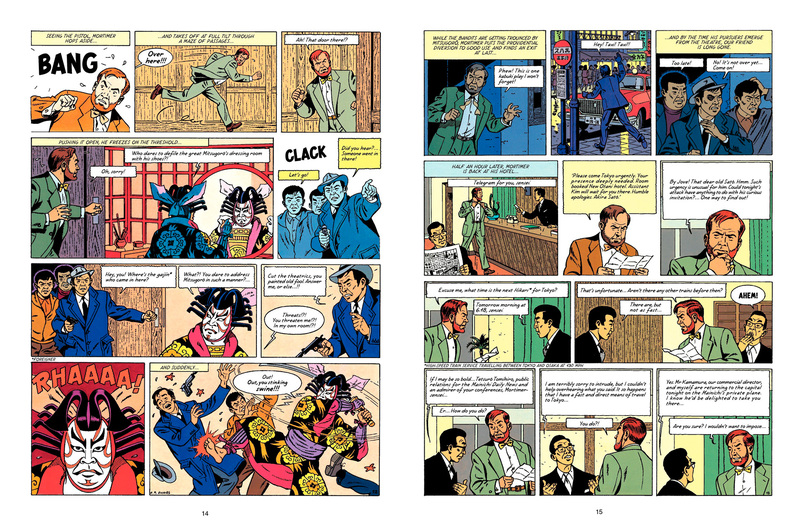 Professor Satō’s Three Formulae is the last of the eight classic Blake and Mortimer adventures written and drawn by Edgar P. Jacobs. 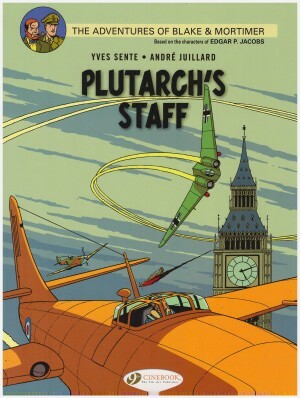 The initial setting for his heroes was a post-war 1940s, but as time went on Jacobs kept his stories contemporary and so this adventure published in 1971 takes place in a recognisably 1960s world. 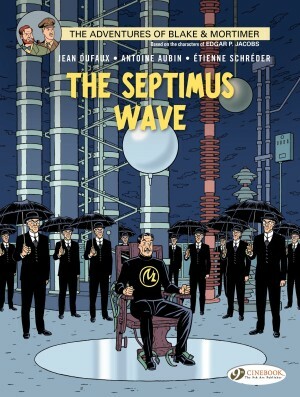 Apart from some updating of suits, hats, cars, high-speed commercial jets and bullet trains, it remains very much the same blend of science-fictional technology, stiff-upper-lipped heroes and detective mystery as before. 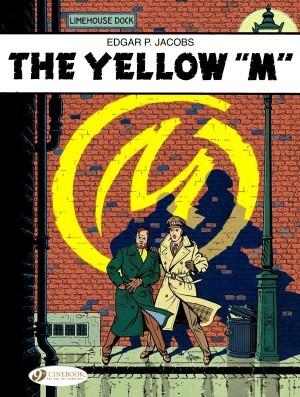 The relative modernity may look incongruous to readers unfamiliar with the original French editions as all books by other writer/artist teams after Jacobs are set in the 1950s or earlier, and Cinebook have published ten of those volumes before getting around to this, the final entry of the original series. 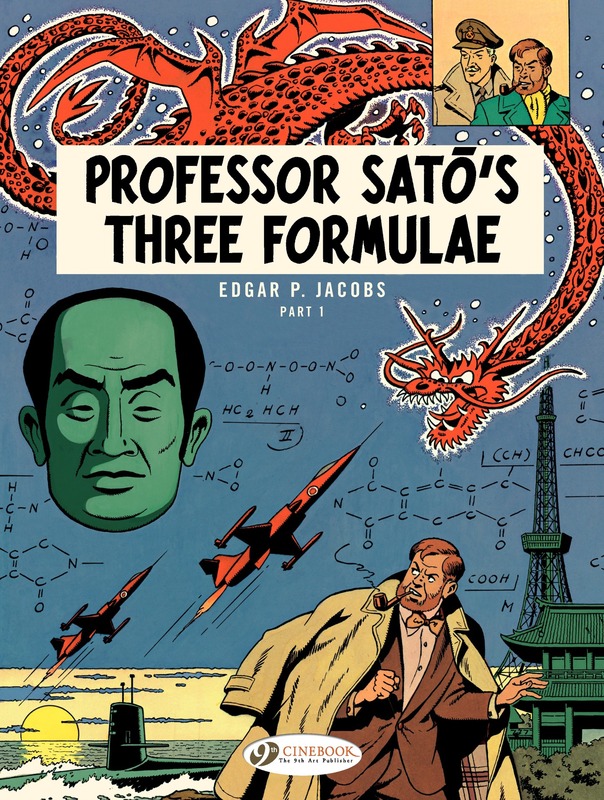 Perhaps one reason for the wait is that Professor Satō’s Three Formulae isn’t pure Jacobs. The first volume was his last published work, and he died sixteen years later in 1987 with the story still incomplete. 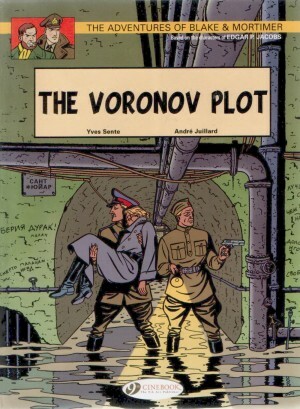 The second volume was eventually drawn by Bob De Moor following the script and pencil layouts that Jacobs left behind. Volume one is ‘Mortimer in Tokyo’. Two jets from the Japanese airforce are scrambled to investigate an ‘anomaly’ in the skies over Tokyo. The UFO turns out to be a flying dragon and both aircraft are destroyed while trying to tackle it. The incredible apparition is no mythical creature, but the creation of Akiro Satō, the eponymous professor at the centre of this story. After the disastrous results of his experiment with flying robots Satō decides there’s only one man he can turn to for advice: his colleague Philip Mortimer who is in Japan, attending a conference. Satō has designed and built a number of android prototypes sophisticated enough to replace humans for the dangerous tasks of space exploration. But his work has attracted the attention of a shadowy criminal organisation who want to use it for their own purposes, and in asking for Mortimer’s help, Satō has accidentally condemned him to death at the hands of his oldest enemy… Colonel Olrik. All of Edgar P. Jacobs storytelling powers are at work on this last volume, with some great set-pieces of action against beautifully detailed backdrops, but events pass by in a very routine way. While there’s plenty of activity to keep the reader turning pages, this adventure feels too simple for the enormous skills applied to it, as if Jacobs has outgrown his busy, plot-driven adventure story structures, or perhaps the passing years have done that for him. The cliffhanger ending promises an escalation of the story that may pep it up and Professor Satō’s Three Formulae concludes in part two, ‘Mortimer versus Mortimer’.